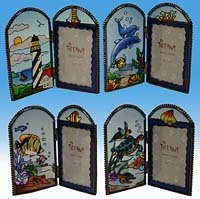 Sea Turtle Picture Frame - Click on an item for more details! This Stained Glass Sea Turtle Picture Frame is the perfect decor for your beach house. Also a great gift for the sea turtle and ocean lover. Quality design with artistic stained glass. A treasure to last a lifetime! 6.25 inches tall and holds 3.5 x 5 inch photo.